Morph Mod allows you to turn in almost to any animal or creature that exists in the world of Minecraft Pocket Edition. You can masquerade as an animal to go hunting. You stay in the same functional character who can dig a mines even in the body of the chicken. Note: You can turn into any mob or animal except the Slime and Wolves! Click on the button M in the lower right corner of the screen that appeared after installing this mod. 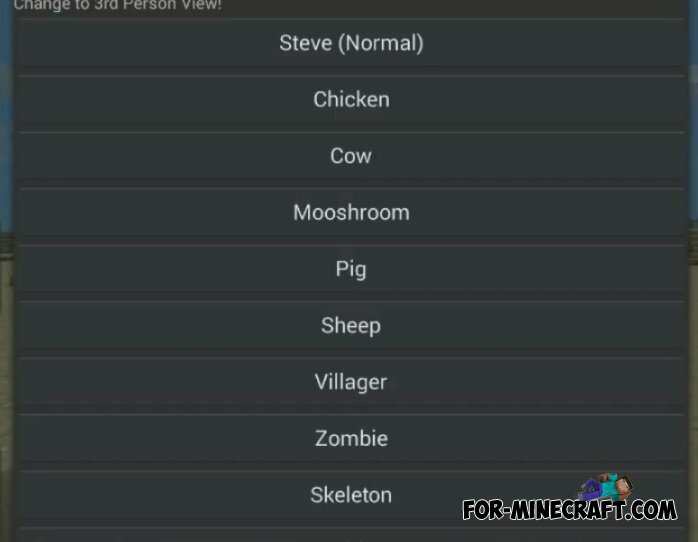 Next you will see a list of mobs and animals in which you can turn, click on the right mob or an animal, and you already have the skin of new creature.